Northern Voices: Reflections on Easter Rising 1916. Book Review. 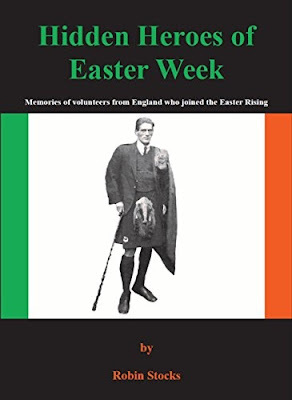 Hidden Heroes of Easter Week – Memoirs of Volunteers from England who joined the Easter Rising. TO this day, the armed rebellion that took place during Easter Week of 1916 in Dublin, known as the ‘Easter Rising’, remains controversial. Some see it as a courageous and brave act that led to the birth of the Irish Republic, whereas, others, see it as a reckless act of folly, an attempted revolt against Britain while we were at war with Germany. British intelligence was certainly aware of the planned rising and the armed shipments from Germany, which also went to the Ulster Volunteer Force (UVF), formed in 1913. Most of the people, who died during the six days of the rebellion, which was supported by Germany, were Irish, mostly civilians, and the poor of Dublin. And they died for a cause that they hardly understood or supported. Moreover, many Irish people were aware in 1916 that Irish Home Rule was on the cards and that partition was inevitable. In January 1913, the Third Reading of the Home Rule Bill had been carried in Parliament and the Government of Ireland Act 1914, provide home rule for Ireland. According to the author of this book, nearly a hundred Irish rebels travelled to Ireland from cities in England and Scotland during the early months of 1916 to participate in an armed uprising which they had heard about. Those from England were frequently described as ‘London Irish’ despite being from other parts of England, such as the city of Liverpool. Some of those who participated during Easter Week also came from the Manchester area and Stockport and this book, is largely about four of those Manchester volunteers. Only two of the volunteers were born in Ireland. These are Liam Parr and Redmond Cox. Gilbert Lynch, was from Reddish in Stockport and Larry Ryan, was born in Salford. Liam Parr had left Dublin about 1910 when he was 19-years-old and had settled in West Didsbury, in South Manchester. He left Manchester in February 1916 to travel to Dublin and undertook military and munitions training at Kimmage Mill, Larkfield, Dublin. On Easter Monday 1916, Parr was in the Liberty Hall office, the headquarters of the Irish Transport & General Workers Union (ITGWU) and was one of the first to take over the GPO office on Sackville Street, on Monday afternoon. After the surrender on Saturday afternoon, he was arrested and returned to England where he was interned in a camp in Frongoch, Wales. Redmond Cox was born in Boyle County, Roscommon, in 1893. As a 22-year-old, he’d been living in Cheetham, Manchester, with his sister. He travelled to Dublin in February 1916. Before surrendering, Cox had been in ‘Four Courts’ and he was later arrested and returned to England. He was released from imprisonment after a fortnight. Gilbert Lynch had been born in Reddish, Stockport, in 1892. A devout Catholic, he joined the National League of Young Liberals in 1908 and was involved with the Clarion in 1916. He claimed to have been a member of the Irish Republican Brotherhood (Fenians) in 1913 and to have joined the Independent Labour Party (ILP) in 1917. A member of Stockport Trades Council, he said that his political outlook had been influenced by reading “The Ragged Trousered Philanthropist.” A gun-runner, Lynch arrived in Dublin the week before Easter with 500 rounds of .303 ammunition and had been carrying small-arms. During Easter week he had been based in Father Matthew Hall, which was being used as a first-aid station and to detain prisoners and spies. Lynch escaped arrest because he had been in hospital having 'twisted his ankle getting over a barricade.' He later made his way back to Stockport. Laurence (Larry) Ryan was born in Salford in 1894. His mother lived in Seedley in Salford. Unlike the others, it is not known when Ryan travelled to Dublin, but he did train at Kimmage Mill and was one of the first, to take up a position in the GPO building. After the surrender, Ryan was arrested and returned to England. He was interned until Christmas in Frongoch camp in Wales. On Easter Monday 1916, the rebel’s had planned to occupy the General Post Office building on Sackville Street, Dublin, and to use this building as their headquarters. Many of the leaders including James Connolly, a socialist who had been born in Cowgate, Edinburgh, mistakenly believed that the English imperialists would not use artillery because they would not bomb their own property. Therefore, they expected an infantry attack on the GPO building and posted battalions in four main positions outside the city centre to command the routes that British soldiers would take to attack the GPO. The rebel plan also involved armed risings in the rest of the country. Bolands Bakery, the Marrowbone Lane Distillery, the South Dublin Union Workhouse and the Jacobs factory, were all sites of revolt. Some of the rebels did use Mauser rifles that had been provided by the Germans and brought to Ireland by Erskine and Molly Childers in their yacht ‘Asgard’ in July 1914. The Easter Rising lasted six days before the rebels on the instructions of their leaders, surrendered on the Saturday. On the third day of the rebellion, Patrick Pearse, a barrister, writer, schoolteacher and nationalist mystic with a martyr complex, had told the rebels in the GPO building that the country was steadily rising and that volunteers were marching from Dundalk on Dublin and that reinforcements would arrive and release them. 'They were later told by a visitor of the despondency in the city as well as the news that the country had not risen.' Connolly was certainly aware, that after the surrender, all those who had signed the proclamation of the Irish Republic, would be shot by the British and that this was a cause he was happy to die for. He told others that they were likely to be imprisoned and should keep quiet about what they had done. Hidden Heroes of Easter Week is a book that is well worth reading. Robin Stocks has done a great deal research on this book and many of the accounts given by the volunteers who took part during Easter Week in Dublin are based on witness statements, interviews with family members and research done in archives and libraries in England and Ireland. Where I think this book is at its weakest, is in its lack of analysis of the rising itself and what effect it had on Irish society. This book does not mention that 450 people were killed and 2,500 injured during the rising and nine reported missing. Among the dead, were 117 soldiers, 41 of them Irish, plus 16 armed and unarmed policeman, all Irish. Some 64 volunteers out of a total of 1,500, who played some part in the rising, were also killed. However, alongside 205 combatants who died, 245 wholly innocent civilians also died. The dead were mostly Irish civilians and Dublin’s poor, who died for a cause they barely understood or supported or were even hostile to. Some saw it as an opportunity for looting. Many of the civilians were killed by British forces using machine-gun fire, incendiary shells and artillery. As Robin Stocks makes clear, not all leading Republicans were in favour of the insurrection. Bulmer Hobson, a leading Fenian, considered it a reckless adventure. Speaking after the rising, Hobson said that towards the end of 1915, Connolly (who had served in the British army in Ireland), had decided to have a 'little insurrection' with the citizen army. 'Bill, we are going out to be slaughtered. Is there any chance? ', asked O’Brien. 'None whatsoever', said Connolly. He then marched his men out of the building along with his fifteen year old son, Roderick (Roddy ) Connolly, who would survive the rising. Although fifteen of the rebel leaders were executed, many of those who took part in the rising were treated with surprising leniency by the British authorities, including the four Manchester volunteers. Some 3,430 men and 79 women were arrested after the rising and 1,424 men and 73 women were subsequently released. Of almost 2,000 men who were interned in England, over 1,200 were quickly released and most of the others were home by Christmas 1916. All were freed under a general amnesty in July 1917. Those who faced a court martial, included 170 men and one woman, Constance Markievicz. Ninety death sentences were passed and fifteen carried out. Those sentenced to life imprisonment, were released within 18-months. Today, many Republican groups and trade unions in Ireland, have adopted James Connolly as their patron saint or founding father. While it is true to say that the execution of the rebel leaders produced sympathy for the cause and turned the men into martyrs, Connolly’s influence was marginalised after the rising – all of Connolly’s children took the anti-Treaty side. Ireland did not become the workers socialist republic that Connolly had wished for. What emerged triumphant from the Easter Rising was Irish Catholic Nationalism and it was Pearse’s vision of Ireland, which was elevated. There was little support for Marxism in Ireland before the rising and afterwards and many Sinn Fein and IRA members were fiercely anti-Communist. Indeed, in the 1960s, communists were banned from the Republican movement. Ireland under Eamonn de Valera’s, Fianna Fail, was protectionist, isolationist, and obedient to the Catholic hierarchy. Divorce, contraception and abortion, were all illegal. It was a world of secrecy and obedience with its Magdalene laundries and the subordination of women. It survived by exporting its young, mainly to Britain, where they could earn a living. The Irish Catholic Church supported Franco during the Spanish Civil War and some Irish Catholic’s, fought with the Blueshirt’s on the nationalist side under Eoin O’Duffy. Others supported the Republican side. None of the Manchester volunteers fought in the civil war which broke out in Ireland in 1922 following the signing of the Anglo-Irish Treaty in December 1921, which was supported by a majority of Irish people. It had been estimated that six times more nationalists were killed in the war than had been killed by the British forces between 1916-1922.